If you’re looking to upgrade your cookware, then you might like to consider the Stellar 6000 five piece pan set. 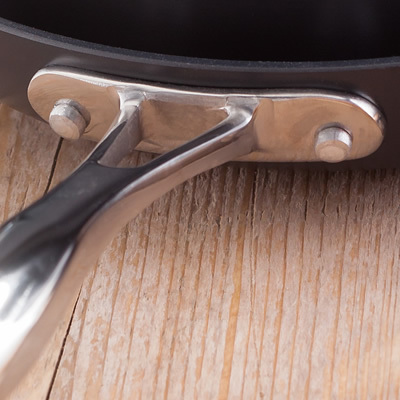 These pans are made from hard, anodised aluminium and are not only immaculately designed, streamlined and pleasing on the eye, but they also perform under the most rigorous of testing. The pans are so hardwearing and durable that Stellar are willing to offer a lifetime pan guarantee; which gives that additional peace of mind, if you’re not already sold. This life-long guarantee is a promise that when purchasing the Stellar 6000 pan set, you’re not just buying pans; you’re making an investment that will last a lifetime. Inside, the pans are coated with a triple layer of Teflon so there is a non-stick finish that ensures your food stays intact, as well as your cooking utensils. This coating makes cooking and cleaning a breeze, and Stellar’s 10 year non-stick guarantee means you’ll never have to worry about scrubbing a pan again. 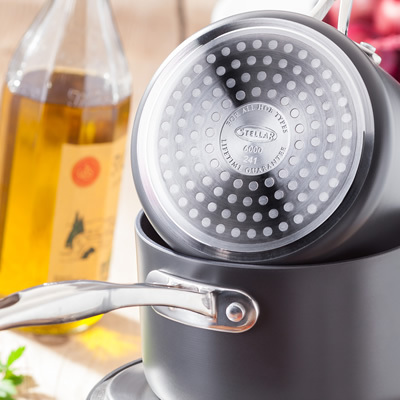 Stellar have many great products and offer several set options, however we found the 5 piece to be a great all-rounder as it delivers everything you could need for everyday cooking. This set contains: a 26cm frying pan, 14cm milk pan, 16cm saucepan, 18cm saucepan and a 20cm saucepan. The fact that the entire set is completely dishwasher safe is an added bonus; even after 1000 washes you can be confident that the pans will look radiant and function in the same way as the day you purchased them. Design-wise this pan set is aesthetically sophisticated, without creatively breaking any boundaries. It’s a pan set that is classic in appearance, yet possesses an overwhelming feeling of expense and quality. Its sleek, streamline handles and stainless steel lids are perfectly finished and offset the main body of the pans to create a very chic product. Their weight alone shows the quality of the materials used; they are heavy but won't cause you any problems when transporting across the kitchen. The pans are also ovenproof, making them a very versatile addition to the kitchen. 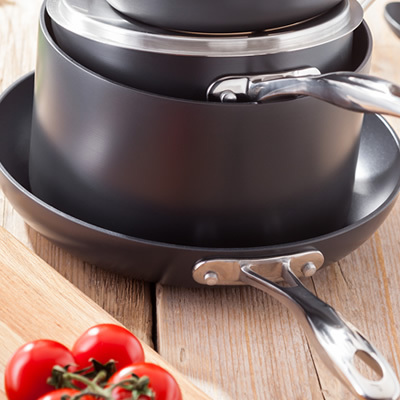 An additional benefit of this set is that these pans are designed to rapidly transport heat through your food which reduces cooking time and maximises efficiency. We also decided on the Stellar James Martin 5 piece knife block set with cutting board, as the name suggests this set comes complete with a cutting board, and has been designed by celebrity Chef, James Martin. 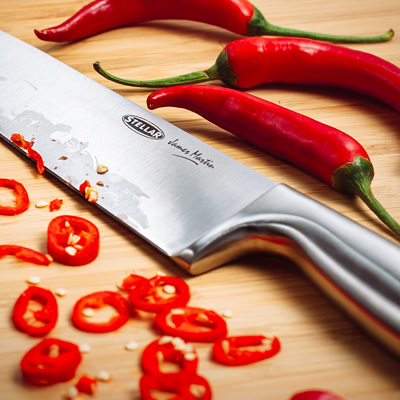 It features five razor sharp molybdenum steel knives with brushed stainless steel handles. The knives are presented in a slim-line black knife block, which has a space to store the chopping block on the reverse. The black knife block is effortlessly stylish and details the iconic Stellar logo. The knife set also comes with a lifetime guarantee, so you can be sure that you are buying a product that will last a lifetime. This set is great value costing just £64 considering it is a product that you will never have to replace, and it offers a great selection. The set contains a 3.5" paring knife, 5" utility knife, 8" carving knife, 8" bread knife, and a 6" cook’s knife. The knives are conveniently dishwasher safe and very robust. The blades slide with ease through every food imaginable with their razor sharp edge. The quality is unparalleled and they are fairly lightweight, so are very easy to handle.